The qualities of glass as an art material are myriad: strength or fragility, transparency or opaqueness, the way it reflects and refracts light. That's plenty to work with, if you can overcome the drawbacks (cost, specialist equipment, a tendency to break easily); this exhibition, presented in partnership with the National Centre for Craft & Design showcasing the work of 15 glass artists from all over the UK, explores them all. Harry Morgan makes solid sculptures which look monumental and opaque but are partly made from delicate straw-like glass. Jeffrey Sarmiento subverts expectations too: his relief sculpture of an abandoned rubber factory doesn't look like glass at all. Some of the artists, like Anna Dickinson, concentrate on pure sculptural forms; others, like Rhian Haf, on the way glass transmits light. Pinkie Maclure makes stained glass in a traditional style but with very contemporary themes. Edinburgh-based Geoffrey Mann takes as his starting point the (possibly apocryphal) story that the wine bottle was invented in Leith. Erin Dickson's 'Chinese Whispers' engaged five different glass artists around the world, each artist sending the next a set of instructions for reinterpreting a historic vessel: the five contrasting results are fascinating. The installation by Belgian-born glass artist Griet Beyaert and digital artist Paul Miller is an immersive environment of sound and coloured light. All these are proof that the possibilities of glass in art are still far from being exhausted. National Museum of Scotland, until 16 Sep, free. 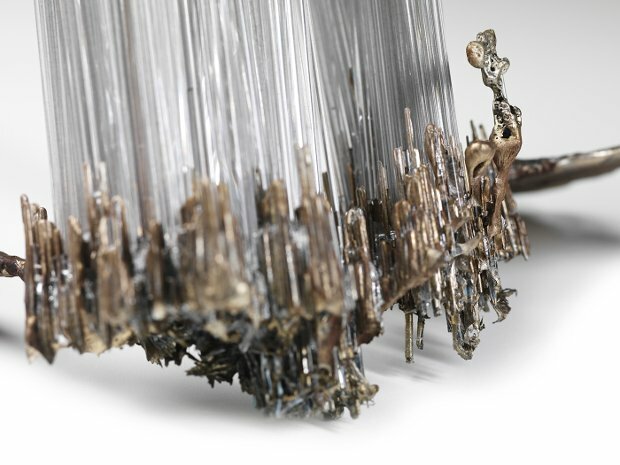 An exploration of glass work in Britain today, presented in collaboration with the National Centre for Craft & Design and featuring the work of artists pushing the boundaries of what can be done with glass as a medium.